Twenty-six year old Anna von Hausswolff recently released her second album, Ceremony, to little fanfare but much celebratory love from reviewers. It is a dark, brooding, mourning gut-puncher that is unlikely to leave you with cheer and yet its simplicity of arrangement and beautiful, sparse atmosphere make it a collection of songs that endures and encourages revisits. On Tuesday von Hausswolff returns to London with a show at Hoxton Bar & Kitchen and this gave Londonist the perfect opportunity to speak to the Scandinavian singer-songwriter about Ceremony, her love for Lisa Left-Eye Lopes and why she'd like to play a gig at the London Dungeon. You've been touring quite extensively since the release of the album a few months ago. Is touring a necessary chore for you or do you enjoy the experience? Both. It´s a necessary chore to earn money and to gain routine, but I thoroughly enjoy the experience. I learn a lot from the people I meet and the people I play with. What were the challenges of translating Ceremony from its recorded form to the live setting? The main instrument on Ceremony is a church organ and you will never be able to copy the sound from a specific church organ as it is acoustically customised for one room. So, the first challenge was to find good church organ sounds and settings on my electronic organ. The second challenge was to balance those new sounds with my band without destroying the dynamics of the songs. But, since I work with great musicians - Karl Vento, Filip Leyman, Ulrik Ording, Christopher Cantillo and Daniel Ögren - the challenges only gave us joy and excitement. Which song was the easiest to transform in this way? The guitar based songs Liturgy of Light, Sun Rise and Harmonica were the easiest ones. All the organ-based songs were the hardest ones. Especially Deathbed, Epitaph of Theodor and Goodbye. Your first ever gig in London was earlier this year. What was it like for you? Yes, we played our first show at Village Underground in April. That was an amazing experience and the crowd was awesome. During this show I met my dream sound technician, Justin Grealy. He's been working in the business for over 30 years and he knows exactly how to make the band sound big. I will bring him with me on my upcoming tour and I´m really looking forward to collaborating with him and coming back to London. Hopefully Hoxton Bar & Kitchen will have chairs for the audience! And when was your first ever visit to London? I came to London for the first time when I was 9. Me and my sister came there with our father to visit and live at his friend Mike Harding´s place. I remember walking down the streets of London in a pink latex cap that I bought close to Madame Tussaud and people were laughing at me. I had seen a music video with TLC just a couple of weeks earlier and my hero, Lisa Left-Eye Lopes, had had a cap like that. I also remember our visit at the London Dungeon. Me and my sister learned all the torture methods they used during the medieval times and then we described them to all of our friends back home, who became scared of our stories. I hope I´ll get to have a show at the London Dungeon someday. A little nostalgia trip. That would actually be amazing. What else do you like about London? I like the people, the art and the size. Let's turn to Ceremony again. What was the starting point for you in terms of beginning work on the record? The starting point was me moving to Copenhagen. A lot of things happened in Copenhagen. I met new friends and gained some new interests. I started to listen to drone metal and got fascinated by that art form which got me leaning towards a heavier and instrumental sound. Was it clear from the beginning what the concept for the album was going to be? I can´t remember exactly. My grandfather´s words and death inspired me to write an album about things that matter to me and I felt that I wanted to write an album about the frailness of life. I believe I succeeded in that regard. You've worked with your siblings on the visuals for tracks from this album. Are you a very close family? Yes, we are like a gangster family. We stick together, work and support each other. Will you perform songs from your first album on this tour as well? No, not yet. I have to learn to appreciate them again. Do you ever write new music whilst you're on the road? I try to! The great thing about touring is that you get a lot of time to develop your sound with the band. When you find a new sound then that sound usually ends up in a new song. So, I´m working on fragments of sounds at the moment. So you've started thinking about your next project already? Yes. It will be great and brilliant. We don't doubt that for a second. Can you give us a hint about the direction you're heading with it? I will evolve my way of using the organ and I will approach my next project with a free and open mind. Ceremony is available now through City Slang. 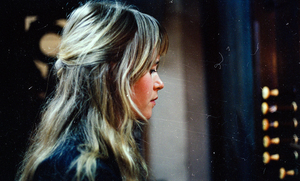 Anna von Hausswolff plays Hoxton Bar & Kitchen on Tuesday 15th October. Tickets are available HERE.